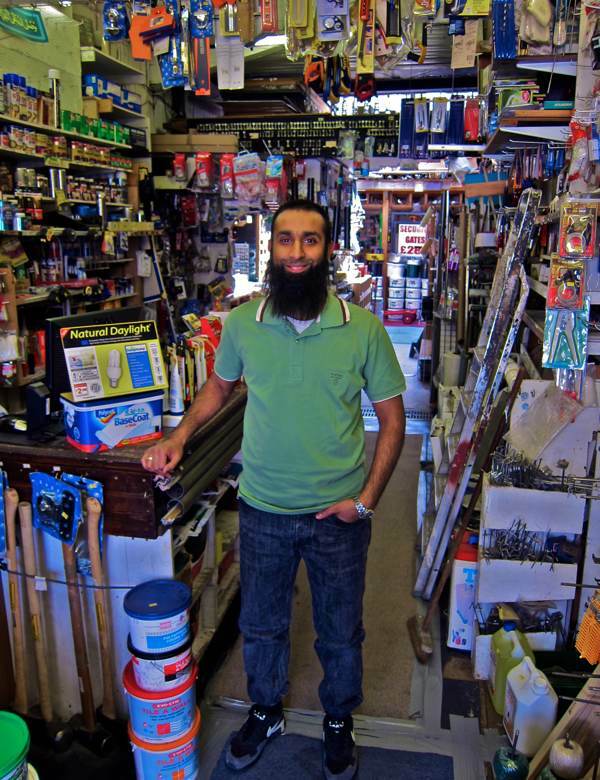 If you need to have a key cut, get scissors sharpened or buy a sturdy metal bucket, there is no better place in Whitechapel to go than M&G Building Supplies, Hardware & Ironmongery at 20 Cambridge Heath Rd, where you can be assured of a generous welcome by proprietor Sarfaraz Loonat. 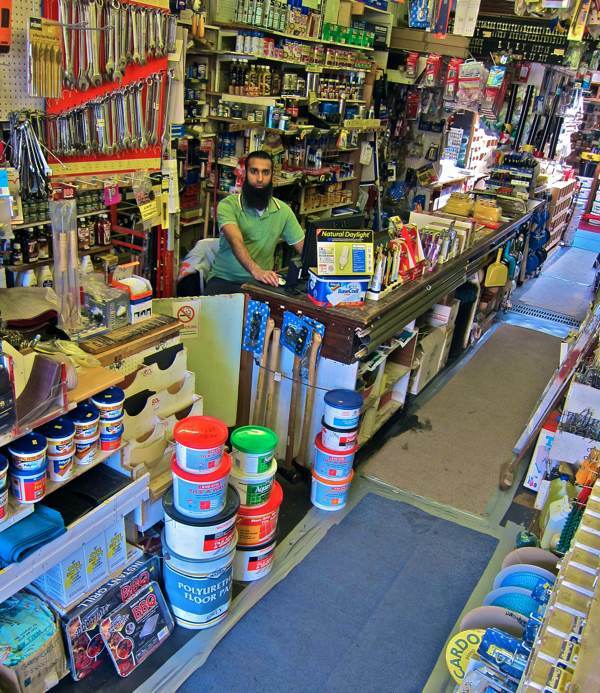 Sitting behind the counter like the captain at the bridge of a great ship, he waits poised to supply your every need in do-it-yourself and household maintenance. In his mind, Sarfaraz has an exact virtual replica of the shop and, by searching this mental labyrinth, he can instantly recall where every single size and type of nut, bolt, watering can, hinge or spanner can be located in the crowded shelving, cupboards, racks and draws of his actual shop. 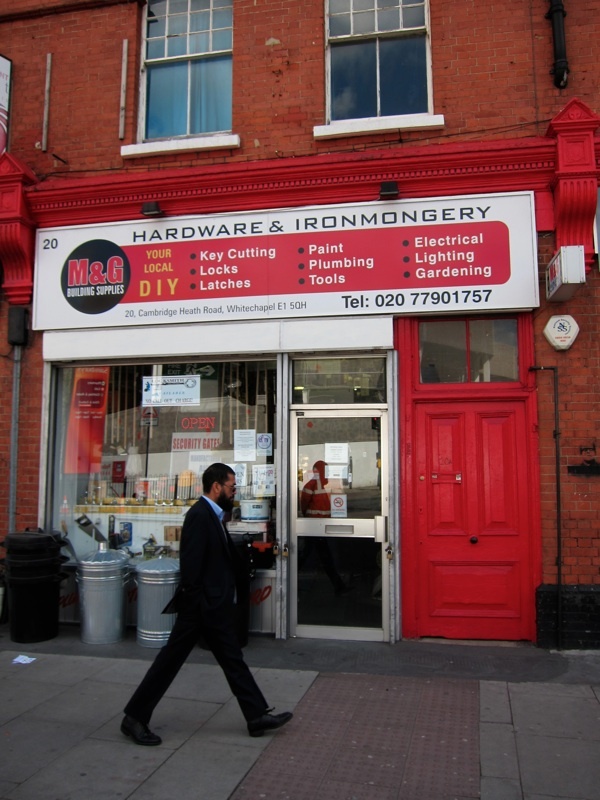 Sarfaraz relishes the opportunity to offer a personal service that cannot be matched by the superstores and, for connoisseurs of ironmongery and hardware, M & G is a rare delight. In the meantime, Sarfaraz and his wife had two daughters, and all their friends and relatives now assist in keeping the shop staffed until the children are of school age. “Then it will be me and my wife together in this shop full-time and our aim will be to work towards buying a house for our family.” said Sarfaraz, eagerly envisaging his future. 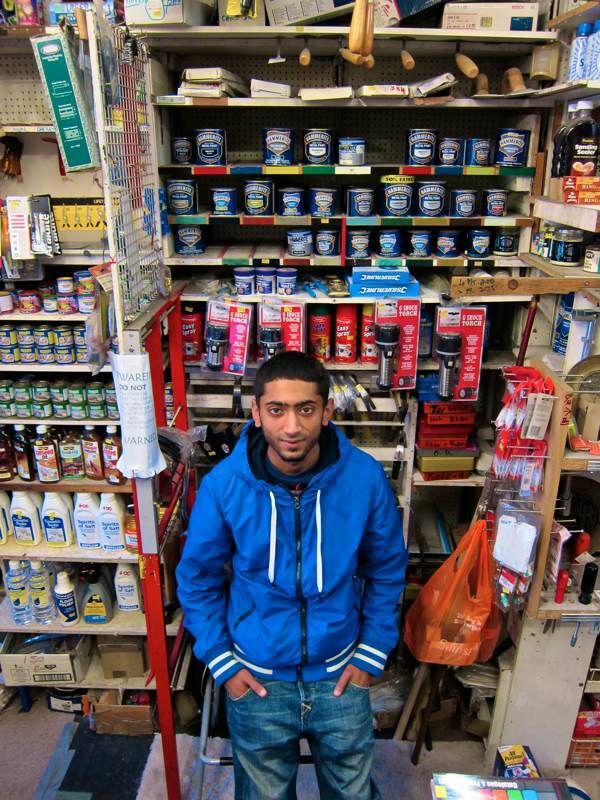 Making an unexpected radical choice, Sarfaraz Loonat swapped the corporate world for that of the independent shopkeeper and, at thirty-two years old, he has found that the challenge has given him more self-respect and and satisfaction, as well as bringing him back to heart of his family and the centre of his local community in Whitechapel. Sarfaraz’s nephew Mohammed Mayat helps out in the shop. De Hailes’ Locksmith & Ironmongery in Key Close, Whitechapel, 1890. James George de Hailes stands on the far right with his father James next to him. Thank you for another wonderful story. When I have been in, they are always so helpful. I love shops like M&G Hardware and London Trimmings and will certainly go there when the need arises. Thank you for telling us about them. After reading yesterday’s piece about the East End Trades Guild I feel worried for their future as the Cambridge Heath Rd area with its small family businesses and pretty shop fronts could be the next target for the ruthless landlord. Perhaps it already is. I hope the Guild gets lots of new members, fast. A real treasure trove! Thank you! Like an Aladdins cave, so many things to see and buy. I found this website in The East of London History Society newsletter. What a find! I feel like retiring to a room on my own and reading every one of the previous entries. My ancestors were Huguenots. I haven’t visited Spitalfieds area for a few years. 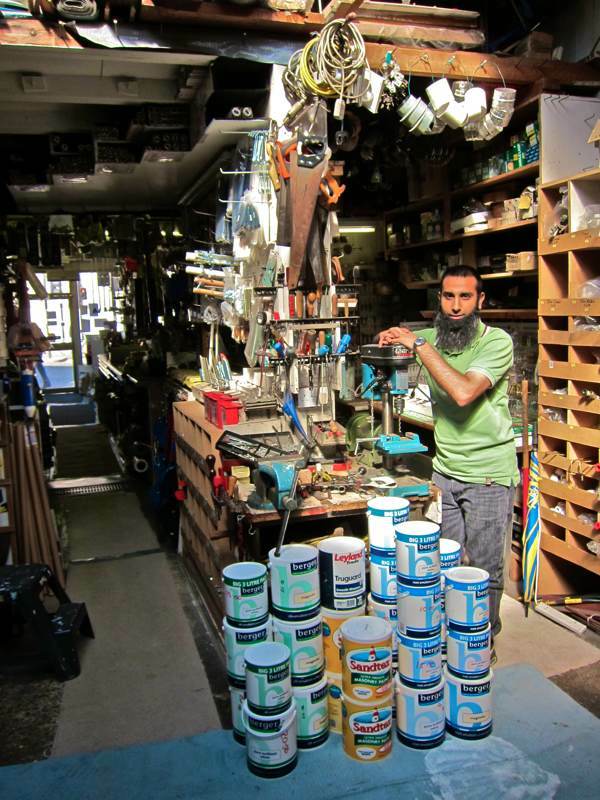 Wish we had a shop like Mr Loonat’s here in Dorset, there must be everything you would ever need and it would bring a whole new meaning to DIY. Sarfaraz has the correct business attitude to succeed. Customer service is everything. No mission statements (that no-one remembers anyway) are needed to understand this. Neither are Powerpoint presentations, nor the fluff, fog and sludge of corporate meetings. To the ‘gentle author’ you have recorded a very befitting and accurate article. Firstly, well done! Secondly, Thank you. I will be proud to show my two daughters when they grow up this very article and will also forward on this special heart touching article to the late Mr Padam’s family…the De Hailes and Padam legacy lives on god willing. A very proud shop keeeper ‘again’ thanks to you! I totally agree with Stefan, customer service is the key to success. Furthermore the story tells everything. This sucess is the result of Patience, Transparency, Hardworking, Attitude, Honesty and of course customer service. I hope and request all the people to keep the ancestors’ history by following the way Sarfaraz has done it. Thank you young man for providing a vital service in the area, it’s always nice to have someone who stocks most products and has some knowledge on them. There is normally always a smile that greets me whenever I walk in, don’t get that from the big stores. A tradesman like me can phone up and check what he has in stock and have it ready for me to pick up. Nothing better than the old traditional service with a smile, still waiting for my order of skyhooks thou. A great shop & article. They always have what you want! What a lovely find. I was searching for a photograph of the shop I use to spend weekends in at the back hiding in the wooden shelves. My grandmother and grandfather was Dorothy and Ronald bull. I wish I knew more of the background of them but unfortunately they have both since passed on. Lovely to see the history of the shop still remains. Dorothy de Hailes and Ronald Bull were my grand parents. I once worked at the shop for a week during the school summer holidays back in 1979. Thank you for the wonderful write up and for including the history in the article. I’m so pleased to see that the shop is still going and is so true to its original form and purpose. The shop in Key Close had an incendiary bomb land on it which caused the shop to catch fire. James De Hailes ran the shop with the aid of his son James known as Jim, his son in law Ron Bull and George Prevost who my grandfather took on when just a boy and gave him a job for life teaching him all there was to know about the trade. 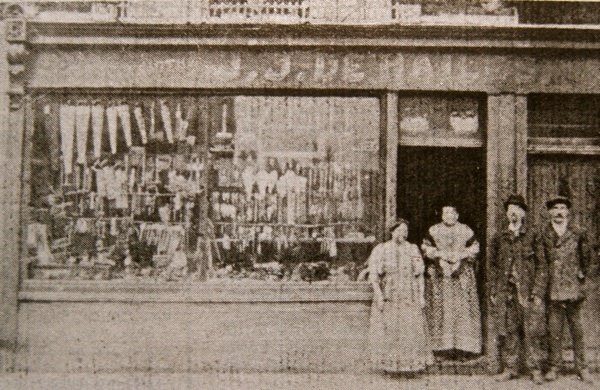 Beatrice Hill married James De Hailes and they both lived above the shop in Key Close bringing up their family. They had nine children but only three survived, John left the family home and started up on his own. James went into the family business and helped his father with both the shop and stall that was taken out on Saturdays. Ron joined the shop on being demobbed, he had married Dorothy in 1942 just before being called up. They eventually had four children and all four worked in the shop for short periods, mainly on Saturdays. I was the eldest of the four children and for working on a Saturday my grandfather would give me half a crown which was a mint of money to me at that time in the 1950′s. I would have liked to work full time in the shop but it wasn’t considered suitable for a girl. James died in 1956 and left the shop shared between his son James, Ron and George. Owing to certain problems left best unsaid the shop started to go downhill and it became a hard fight to keep it going. George left and Ron and James carried on until James retired. Ron’s wife Dorothy then joined him running the shop, it was hard going but Ron was intent on keeping the shop going to celebrate 100 years. After 101 years and large stores opening up in the surrounding area Ron and Dorothy felt they were too old to modernise and decided to retire. There were very few locks that couldn’t be repaired, there was never a call out charge just the cost of the repair, and the shop had a very good reputation with very loyal customers, it was the end of an era. I was so pleased to see that the shop is now in the hands of someone who is willing to carry it on in the same tradition, a couple of screws or half a dozen nuts and bolts. It may not make a lot of profit, but going in for that couple of screws can bring in further custom especially when customers find they are given good, friendly service. Nice modern frontage to the shop and certainly plenty on offer, Well Done Sarfaraz thank you for keeping tradition alive, I still feel homesick when I see the old place even if it looks a little different today.